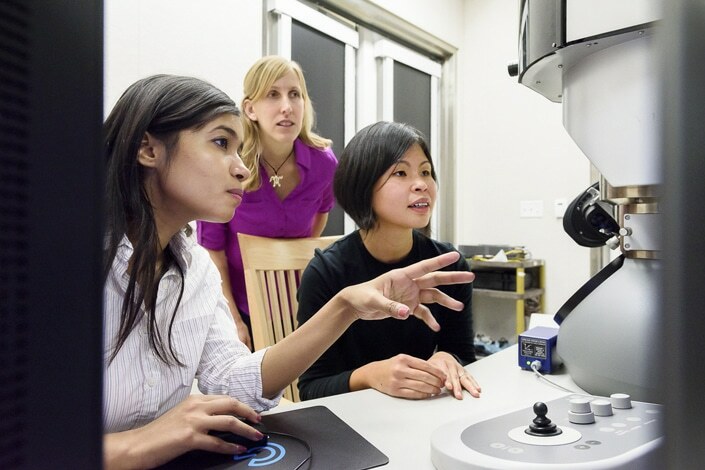 An unimaginably small reaction was captured by researchers in the Dionne lab, which is 18 feet below the Engineering Quad of Stanford University with one of the most enhanced microscopes in the world. Complicated experiments were performed by the lab members to capture dynamic, real-time visualizations of atoms that could someday increase the life of phone batteries and enable electric vehicles go farther on just a single charge. These experiments sometimes required 30 hours of work continuously. The researchers working in the tunneled labs recorded atoms moving in and out of nanoparticles less than 100 nm in size, with a resolution reaching 1 nm. The ability to directly visualize reactions in real time with such high resolution will allow us to explore many unanswered questions in the chemical and physical sciences. While the experiments are not easy, they would not be possible without the remarkable advances in electron microscopy from the past decade. The experiments concentrated on hydrogen moving into palladium, a class of reactions called intercalation-driven phase transition. This reaction is physically similar to how ions travel through a fuel cell or battery during discharging or charging. Studying this method in real time provides insight into why nanoparticles prove to be better electrodes than bulk materials and suits Dionne’s bigger interest in energy storage devices that can stave off permanent failure, hold more energy and charge faster. The Dionne lab developed palladium nanocubes for these experiments. Palladium nanocubes are a form of nanoparticle ranging in size from almost 15 to 80 nanometers, which were placed in a hydrogen gas environment within an electron microscope. The researchers were aware of the fact that hydrogen would alter both the electronic properties of the nanoparticle and the dimensions of the lattice. They assumed that, with the ideal aperture configuration and microscope lens, processes called scanning transmission electron microscopy and electron energy loss spectroscopy could show hydrogen uptake in real time. After months of trial and error, the results were extremely detailed, real-time videos of the modifications in the particle as hydrogen was introduced. The whole technique was so complicated and novel that the first time it worked, the researchers did not even have the video software running, resulting in them capturing their first movie success on a smartphone. Following these videos, the researchers analyzed the nanocubes during intermediate stages of hydrogenation using a second method in the microscope, called dark-field imaging, which relies on scattered electrons. The researchers stopped the hydrogenation process by plunging the nanocubes into an ice bath of liquid nitrogen mid-reaction and then dropping their temperature to 100 degrees Kelvin (-280 F). These dark-field images were used to check that the application of the electron beam had not influenced the earlier observations and enabled the team to observe detailed structural modifications during the reaction. With the average experiment spanning about 24 hours at this low temperature, we faced many instrument problems and called Ai Leen Koh [co-author and research scientist at Stanford’s Nano Shared Facilities] at the weirdest hours of the night. We even encountered a ‘ghost-of-the-joystick problem,’ where the joystick seemed to move the sample uncontrollably for some time. As most of the microscopes work with the specimen held in a vacuum, the microscope employed in this research has the advanced ability to allow the researchers to introduce gases or liquids to their specimen. In addition to being a widely applicable proof of concept for this suite of visualization methods, observing the movement of atoms offers greater validation for those scientists with high hopes for nanoparticle energy storage technologies. The team saw the movement of the atoms through the corners of the nanocube and further observed the formation of different imperfections within the particle as hydrogen moved within it. This almost sounds like an argument against the promise of nanoparticles but that is because it is not the whole story. The nanoparticle has the ability to self-heal. When you first introduce hydrogen, the particle deforms and loses its perfect crystallinity. But once the particle has absorbed as much hydrogen as it can, it transforms itself back to a perfect crystal again. This has been described by the researchers as imperfections being “pushed out” of the nanoparticle. The capability of the nanocube to self-heal allows it to be increasingly durable, a vital property required for energy storage materials that can sustain several discharge and charge cycles. The need for higher quality energy storage grows as the efficiency of renewable energy generation increases. There is the possibility that the future of storage will rely on new chemistries and the findings of this work, including the microscopy techniques refined by the researchers along the way, will apply to almost any solution in those categories. The Dionne lab has several directions it can take off from here. The researchers could look at a wide range of material compositions, or even compare how the shapes and sizes of nanoparticles affect the way they function, and soon, take advantage of the latest upgrades to their microscope in order to study light-driven reactions. Currently, Hayee has moved on to perform experiments with nanorods, which have increased surface area for movement of the ions, promising potentially even faster kinetics. Additional contributors to the work include Andrea Baldi, a former postdoctoral researcher in Dionne’s lab and currently an assistant professor at FOM-DIFFER in the Netherlands, and Robert Sinclair, professor of materials science and engineering at Stanford and member of the Stanford Cancer Institute. Dionne is a member of Stanford Bio-X, an affiliate of the Precourt Institute for Energy and a member of the Stanford Neurosciences Institute. This research received funds from the Department of Energy Office of Science Graduate Fellowship Program, the Foundation for Fundamental Research on Matter (FOM), the SLAC National Accelerator Laboratory in concert with the Department of Energy, the National Science Foundation and the Air Force Office of Scientific Research.